Trinity County is home to three reservoirs and a Wild and Scenic river that offer unparalleled beauty without the crowds. Whatever water sport is your favorite, Trinity has the perfect venue for you to jump in and discover why families have been coming to Trinity on vacation for generations. Bring your own boat or rent at one of our many marinas. Annual Launching Pass from Shasta Recreation Co.
Beautiful Trinity Lake, is one of Northern California’s favorite houseboating playgrounds. Here you find miles of tree-lined shores and countless secluded coves perfect for claiming your own overnight base camp. Patio boating is another way to spend a blissful afternoon. Picnic or bbq while floating on the serene waters. Families find these outings to be great times to enjoy nature and each others’ company. Trinity Lake, previously called Clair Engle Lake, is on the Trinity River formed by the Trinity Dam. The dam was built by the U.S. Bureau of Reclamation in 1961. The lake’s capacity is 2,447,650 acre ft. , making it the third largest reservoir in California. The lake’s surface is at 2,370 ft above MSL. Trinity Lake captures and stores water for the Central Valley Project, which provides the Central Valley with water for irrigation and produces hydroelectric power. This lake is known for its many small arms, glassy inlets, and great water-skiing conditions. Trinity boasts unparalleled water sports opportunity—from world-class trout and bass fishing, to miles of smooth blue water perfect for boating, skiing and boarding. Accommodations range from lakeside cabin rentals, nearby RV parks and campgrounds, and nearly 147 miles of shoreline for camping and anchoring private and rental boats. The special attraction of Lewiston Lake is its quality fly fishing for rainbow trout. The lake is also popular with trollers and bank anglers. A 10-mile per hour speed limit has also made the lake popular with float tubers and quiet canoeing and kayaking. 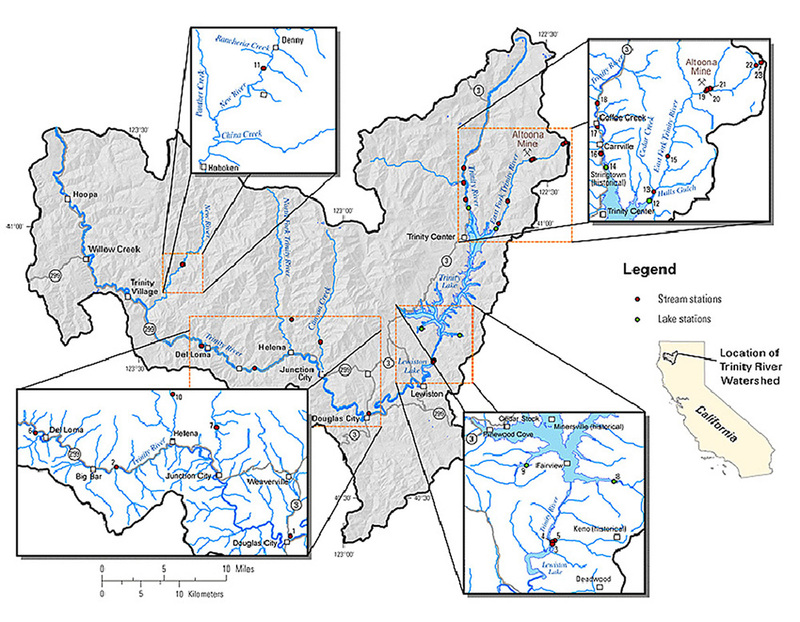 Lewiston Lake is a reservoir created by Lewiston Dam on the Trinity River, near the towns of Weaverville and Lewiston. The lake is used for trans-basin diversion to the Sacramento River and flood control, as well as for hydroelectric generation, and is a popular destination for water sports, including canoeing, kayaking, fishing, and houseboating. The area offers excellent wildlife viewing for bald eagle, osprey, otter, and deer. A quiet kayak trip on the lake allows visitors to view the wildlife. You may see an eagle dip into the lake for fish or an otter swim through the clear water. Ruth Lake, in southwest Trinity County, is the only reservoir on California’s Mad River. The reservoir and adjacent community were named for early settler Ruth McKnight. The reservoir was formed by construction of R. W. Matthews Dam in 1962 primarily for domestic and industrial water supply to Arcata, Eureka, and other communities around Humboldt Bay. A two megawatt hydro-electric plant with two 1-megawatt turbine generators is powered by water released from the reservoir. The plant generates 5 million kwh during an average water year. Dry-weather releases flow down the Mad River from the reservoir to be recovered by Humboldt Bay Municipal Water District’s Ranney collectors near Essex, California. The summer resort community of Ruth developed to expand recreational use of the reservoir. There are 174 cabin lease sites surrounding the reservoir. Registration and inspection is required for all watercraft prior to launching on Ruth Lake. Trailered and motorized boats may be launched only at the marina or at the Ruth Recreational Campground. For those who prefer their water fun stretched out for miles, the Trinity River provides plenty of fast action and current. The Trinity River provides great rafting and kayaking white water fun with several local rafting guides to take you down river safely. Trinity River Adventure Inn provides kayak lessons, guided family & dog-friendly trips down the mild, but still exciting Upper Trinity River. If it’s fishing you prefer, then trophy size Salmon, Steelhead and Trout are plentiful most of the year but more abundant in the winter months when the Salmon make their run up river to spawn. There are also many smaller streams to provide both white water and fishing enjoyment if you want to explore other remote areas of Trinity County. The 43 miles of the Wild and Scenic Trinity River from Lewiston to Pigeon Point is a class I and II segment that flows out of the Trinity and Lewiston Lakes. This clear, cold section of the river is world famous for its fly fishing. Paddlers enjoy the narrow valley with Ponderosa Pine, Douglas fir, Oaks, and Madrone trees coating the walls of the canyons. If you would like more adrenaline rush, the waters below Pigeon Point rage at class III-V.
Those interested in a more relaxing experience can enjoy the abundant camping options in the area or head for the trail with your friends, horses, or dog. If you would like to stay at the river’s edge, you can always swim, fish or do a little gold panning. The river can be accessed from many locations along this stretch of the Trinity River. Salmon, steelhead and trophy-sized brown trout are prized by anglers worldwide, and amateur gold panners can find “color” along the shoreline. The picturesque river gorge follows much of Highway 299 and Highway 3, and is spectacular when wild flowers bloom in the spring, and during the brilliant fall foliage in the autumn.